If you have a special request or wish to order multiples, please call us on 01634 540078. 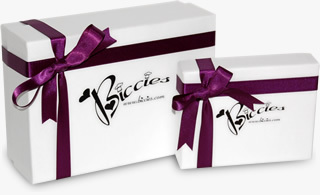 Biccies Singles and Boxes are normally dispatched within 2-5 working days from receiving your order. All Biccies Singles and Boxes are sent by Royal Mail. Our biscuits are cleverly and luxuriously packed to ensure they are received in perfect condition. To date we’ve never had a complaint about any biscuits being broken (and we’ve sent out tens of thousands). Rest assured if ever there was such an unlikely event, our customer care department would do their utmost to take care of you. We do not however take responsibility for any delays in delivery by Royal Mail; this includes industrial action which can result in disruption of their service. Biccies does not accept responsibility for return postage costs or items that are lost, those circumstances that are out of our control. 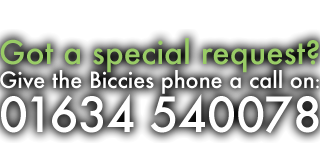 All Biccies bouquets are normally dispatched within 2-5 working days from receipt of order and delivered by Parcel Force who are liable for any damage or loss of goods in their care. If you have a specific delivery date in mind or need your Biccies urgently please call us on 01634 540078.